Are you vegetarian? This food is right for you, it’s called Tortang Talong, I don’t know how translate it in english but I guess you can translate it in the picture. The main ingredient is Egg plant, it delicious and healthy to! It is cheap and easy to cook! So what are you waiting for try it!One of the best Filipino food Here’s the recipe. Roast the eggplants, either in the oven or over gas flame (latter is preferable) until the outside skin is charred. Peel off the skin and mash the flesh with a fork. Make sure to keep the whole thing as intact as possible. In a skillet, fry the onion until translucent and remove. To prepare one torta, beat an egg in a bowl, then dip the eggplant. Hold the whole thing by the stem and don't dip that part in the egg. Add salt and pepper as you like, and if you really want to. add finely chopped cilantro or kinchay to the egg mixture. Heat oil in a frying pan, then when the oil is hot. add the mixture to the pan and layer some onions to the top of it. Let set then turn over with a spatula. Remove to a plate and garnish with tomato slices and cilantro/kinchay. And lastly Serve with rice. hi, salamat sa bisita! sure we can exlinks. just leave a message in my comment box when you're done adding mine.. so that i can add urs too. this post makes me hungry!!! 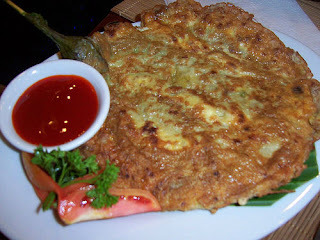 i haven't had tortang talong for so long now...grrr..